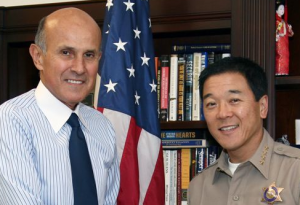 Los Angeles County Sheriff Lee Baca failed to monitor and control deputies’ use of force against inmates in county jails, according to a report issued Friday by investigators for a commission charged with probing allegations of jailer misconduct and abuse. The report by a panel of attorneys working for the Citizens’ Commission on Jail Violence indicated that Baca was largely insulated by his command staff from the problem of use of force against inmates, and suggested that a top department manager encouraged deputies to use aggressive tactics in the jails. “Anecdote is not the same as fact,” spokesman Steve Whitmore said. Undersheriff Paul Tanaka, meanwhile, not only failed to address concerns about violence against inmates by discouraging investigations into alleged deputy misconduct, but actually urged deputies to be aggressive against inmates, according to the commission’s investigative team. The investigators faulted Baca, saying he failed to discipline Tanaka or other top managers despite acknowledging errors in judgment. “The sheriff believes in facts, and a significant number of these items are anecdotes,” he said. Testifying before the commission in July, Baca conceded that mistakes had been made in oversight of the jails, but said changes were being made to improve the situation. On Thursday, the county’s Office of Independent Review, which was set up to provide oversight of the Sheriff’s Department, said some of those changes were having a positive impact, most notably the installation of hundreds of surveillance cameras inside the Men’s Central Jail. The OIR report noted, however, that the department was slow to review allegations of deputy abuse of inmates. The Citizens’ Commission on Jail Violence was created by the Los Angeles County Board of Supervisors last October in the aftermath of widespread allegations of unprovoked violence by deputies against inmates, including a report by the American Civil Liberties Union that referenced eyewitness reports. A federal probe is also being conducted into allegations of violence by deputies inside the jails.